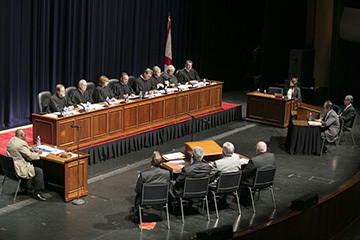 The Alabama Supreme Court and the Alabama Court of Criminal Appeals will hear oral arguments in Wright Center at Samford University Wednesday, Nov. 4. The public is invited to attend. Court will convene at 9 a.m.
Students from area high schools, colleges and law schools will attend the session, sponsored by Samford’s Cumberland School of Law and the Birmingham Bar Foundation. The nine-member Supreme Court of Alabama will hear arguments in a “dram shop” case, Nineteenth Street Investments v. Robertson, et al., beginning at 9:30 a.m. The five-member Court of Criminal Appeals will hear arguments in a capital murder case, John Russell Calhoun v. State of Alabama at 11 a.m.
Case summaries of the cases are available here. About 482 Students from 16 high schools and colleges will attend. To prepare, the students have heard presentations by Birmingham Bar Foundation members who discussed the cases that will be heard and explained oral arguments and appellate procedure. Participating schools are Brown-Mackie College, Central Park Christian, Evangel Classical Christian, Fairfield High Preparatory School, Helena High School, Holy Family Cristo Rey, Homewood High School, Miles College, Montevallo High School, Mountain View Baptist, Pelham High School, Providence Classical School, Ramsay High School, Spring Valley, Tarrant High School and Wenonah High School. Students from Samford and Cumberland will also attend.